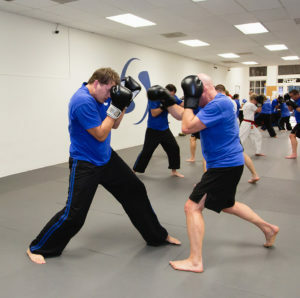 SwiftKick Martial Arts provides a cutting edge approach to self-defense training. The SwiftKick Self Defense Training Curriculum is primarily influenced by functional styles of martial arts including Boxing, Kickboxing, Muay Thai, Wrestling, Catch Wrestling, Jiujitsu, and Street Self-Defense. Essentially, we provide top notch Mixed Martial Arts (MMA) and Self-Defense training used by professional fighters, military, and law enforcement worldwide to everyday individuals. Our San Diego SwiftKick mixed martial arts curriculum is separated into specific modules that help clients develop confidence and skills in striking, defense against strikes, ground and takedown defense, close quarter combat (i.e., grabs, chokes, etc. ), and weapons defense which gives clients a comprehensive and well-rounded self-defense training. In order to foster a productive and enjoyable learning environment in our San Diego MMA studio, all our clients work together without hyper-competitiveness or ego making classes safe, fun, and informative. In our Self Defense Classes in San Diego we recognize the importance of separating self-defense fact from fiction. Because of this, we have our clients train with aliveness. In a self-defense situation, an attacker will be moving, hitting, and incorporating unpredictable and continuous attacks. Aliveness essentially is teaching a client to deal with an opponent who continues to fight back even after you’ve performed your initial strikes or techniques. The best way to develop these self-defense skills is through practical sparring. Practical sparring helps clients remain locked down, structured, in balance, and utilize effective striking, defense, and movement against an active, live opponent. There will never be a way to completely control or predict an opponent but a client can learn to maintain focus and control of themselves and respond intelligently and effectively no matter the circumstance. Our training environment builds the skill, confidence, and adaptability needed to do just that. We also recognize that in an adrenalized state, physiologically our bodies prepare for fight or flight. In this state, simple, gross motor movements are the most effective. For this reason, we focus our self-defense platform on developing effective and efficient techniques rather than moves that require more complex or fine motor control. All our skills training focuses on gross motor movements that will be easy to perform in a self-defense situation. Lastly, we recognize that the mental state of our San Diego clientele largely affects performance in a self-defense situation. Our training incorporates proven methods in sports and performance psychology to help clients practice breathing and remaining calm while under stress in order to maximize their physical performance. In essence, they learn to think less (reducing fear and anxiety) and act more (increasing physical skills) when in a self-defense situation. With consistent training, the physical and psychological confidence of our clients improves and allows them to handle higher levels of physical and mental stress both in training and for self-defense.